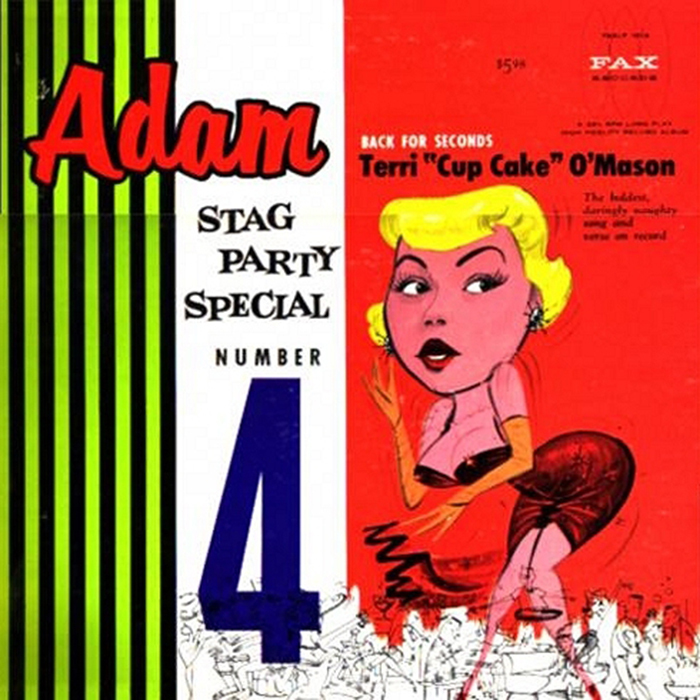 Miss O'Mason was a burlesque performer who signed a contract in 1960 with Fax Records to record for their "Stag Party Special" series of LPs. And where "Cupcakes" (from Stag Party Special Number 2) is a mere taste of her unique talents, here's a full on dessert; "Stag Party Special Number 4; 'Back for Seconds' ". The back cover proclaims, "She's back again, brighter, better, more daringly naughty than before." And from the sound of it, drunker as well. This is an audio experience soaked in gin and smelling of smoke and Old Spice. Terri sings bawdy songs, recites bawdy limericks and tosses off bawdy words like "made", "piece", "tail" and "fairy". Plus she mentions The Russians and The Kinsey Report, so you know it's timely. A shower may not actually wash away the sticky feeling one has after listening to this entire LP, but it helps. Here's the gal that created an overnight sexation with her sizzling first record (Adam Stag Party Special #2). She's back again with a wild sexorama of thrills, laughs and tingling excitement dished out in torrid helpings. "Not so long ago, I met a theatrical agent who advised me that he could put me in important entertainment rooms around the country. He said he could get me in pictures, raise my salary, (Raise what? ), and eventually put me on recordings. What a ridiculous thought. "Cup Cake" on recordings. I told him he was nuts. Recently, while I was appearing at the Clover Club, in Miami, he called me from Hollywood and advised me that a record date had been set up for me as soon as I could get to Hollywood. I asked him, "What idiot would record me? ", (S'cuse, Mr. Fax)....so, here I am on record. I want to thank you (Fax records) for recording me, and all those who helped me along the way, especially the "Wheels" at the Wagon Wheel, Lake Tahoe, the bosses at the Golden Hotel, Reno, and the Golden Nugget, Las Vegas, The Monte Cristo Hotel in Palm Beach and all the other bosses I have played with (S'cuse), played for. Bless you all, Terri." 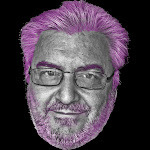 Thanks to WFMU Beware Of The Blog! 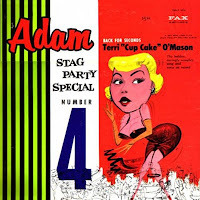 1 comments on "Adam Stag Party - Special #4 Back For Seconds WithTerri 'Cupcake' O'Mason 1960"
Never heard of this lady, but she's like Ruth Wallis, except she does spoken-word in between her tunes. Love her voice and the "naughty" lyrics are fun. I wonder what she actually looked like, and how long she did this act.